Evergreen Landscape & Design builds outdoor fireplaces that will ensure you can use your landscape in a variety of weather conditions. 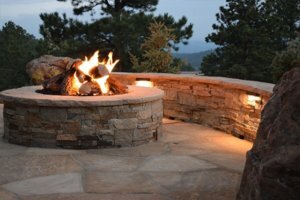 We build outdoor fireplaces in Evergreen Colorado and the surrounding communities of Conifer, Morrison, Genesee, Golden and the Denver Metro that create the best in usable outdoor living spaces. An outdoor fireplace will encourage you to use your landscape even after a summer day has turned to a chilly evening or when that warmer winter day has called you to be outside. You and your guests will be encouraged to use your outdoor living space in colder temperatures as you’re drawn to the warmth of the outdoor fireplace. You will be able to continue your night of enjoyment and relaxation in the outdoor living space and not be forced inside by the cold. We usually install gas service to our fire features to create a safe, clean and maintenance free addition to your landscape. Using natural gas outdoor fire features and outdoor fireplaces provides an easy to use landscape feature that turns effortlessly on and off and never needs to be cleaned of ashes or debris. Outdoor fireplaces can be installed on existing patios or decks, or created in the design of a new landscape plan. Outdoor fireplace design is not a one size fits all fire feature and we tailor each outdoor fireplace to fit the architecture of a customer’s home and the desired overall use of the outdoor living space. The most attractive outdoor fireplaces are installed with custom masonry surrounding a gas burning fireplace and usually will have a mantel and a hearth. While we like to use stone, it’s not right for every situation, as some outdoor fireplaces use a stucco finish to accent the existing home’s siding. Incorporating an outdoor fireplace within our outdoor living spaces, creates more of an outdoor room feel to the landscape. Often an outdoor space without the heating of and outdoor fire place goes unused on a cold Colorado evening. We can fix that with an amazing outdoor fireplace that starts up with the touch of a button! Get started with a Design Consultation Today!Our Landscape Designer will contact you to discuss your pojects needs.